Media and Contents: One decal sheet and instructions. Advantages: Fastest and simplest way to apply zimmerit; each decal is individual (you don't need to cut around the outline); decent depth to the pattern. 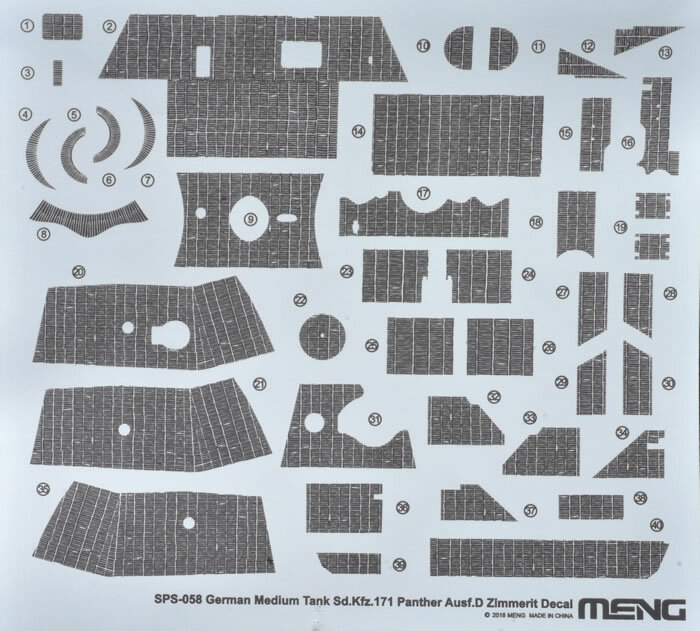 This is without doubt the easiest way to apply Zimmerit to your Meng 1:35 scale Panther Ausf. 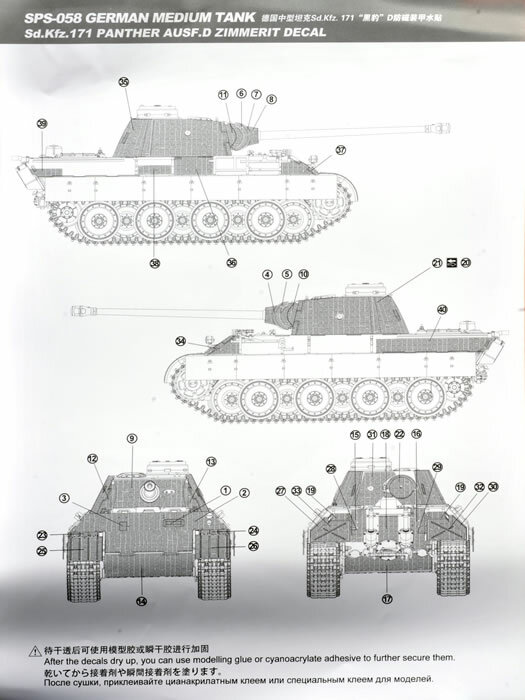 D.
Meng has also released a separate decal sheet with a single Zimmerit pattern for their 1:35 scale Panther Ausf. D kit. Zimmerit was rare on these early Panthers but Meng has sourced one subject with Zimmerit on the turret and partial areas of the hull. Decals are supplied in the kit, and this Zimmerit sheet will make the job easier for those who would like to portray this option. The decals are printed onto one sheet with the patterns in relief. Please note that you do not have to cut these out of the sheet – each decal is an individual decal with virtually no decal film surrounding the raised Zimmerit. Very clever. Individual decals are supplied for all the various nooks and crannies of the turret, including the mantlet, and tricky areas on the rear armour plate. The pattern looks nicely raised on the sheet and should be quite visible on the model after painting. A subtle wash and dry brush will help further emphasise the Zimmerit pattern. I recommend that you should apply a primer coat plus gloss coat as a base for the Zimmerit decals.